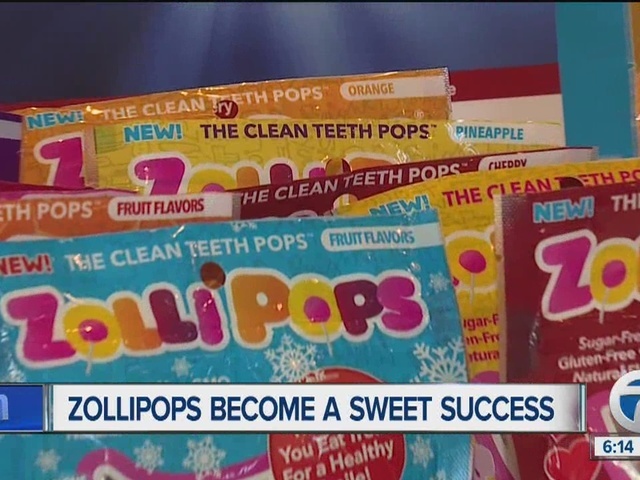 It's a story of sweet success and a healthy twist on a classic candy called Zollipops! It all started when Alina Morse was 7-years-old and she was offered a sucker at the bank. Her dad said it would rot her teeth, and Alina replied, "Why can’t we make candy that’s good for your teeth?" The rest is history! You’ve seen her on Shark Tank, Good Morning America and the Steve Harvey Show, and she's even been featured in magazines like Fortune and Entrepreneur. Now, at just 13-years-old, Alina Morse is the CEO of a thriving Metro-Detroit based business, Zollipops. “It just starts with using your imagination and coming up with an idea you think is crazy enough to work,” says Alina. Zollipops is a sugar free candy that helps prevent cavities instead of cause them. Alina’s sister Lola came up with the name, and proud dad Tom Morse helps run the business. "I’m lucky they have these ideas and that we can do this as a family,” says Tom. Zollipops come in 6 flavors made with natural ingredients and are safe for a wide variety of dietary needs. They are marketed as the ‘after you eat treat’. “After a meal your mouth gets very acidic so it makes your tooth enamel very soft,” explains Alina. Zollipops are designed to neutralize the acid in your mouth helping teeth stay strong. They don’t leave a film behind in your mouth like many other hard candies do. It’s an invention that landed Alina in the latest edition of “Ripley’s Believe It or Not” and earned her an invitation to the White House. Zollipops are currently available nationwide in Whole Foods, Toys ‘R Us. Meijer and Amazon.com. New products like Zolli-canes will soon be on shelves for the holidays. “Entrepreneurship is all about thinking of an idea and going for it and believing in yourself,” says Alina. For more information, visit zollipops.com .